Absentee Ownership is an inquiry into the economic situation as it has taken shape in the twentieth century, particularly as exemplified in the case of America. 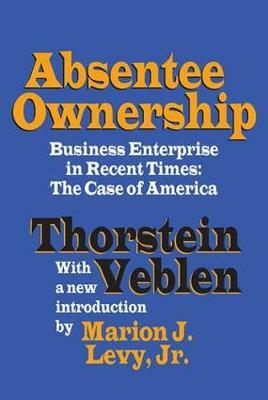 According to Thorstein Veblen, absentee ownership is the main and immediate controlling interest in the life of civilized men. It is the paramount issue between the civilized nations, and guides the conduct of their affairs at home and abroad. World War I, says Veblen, arose out of a conflict of absentee interests and the peace was negotiated with a view to stabilize them. Part I of the book is occupied with a summary description of that range of economic circumstances and that sequence of economic growth and change that led up through the nineteenth century and have come to a head in the twentieth century. Part II is an objective, theoretical analysis of those economic circumstances described in the first part of the book. Marion Levy writes in his introduction about the phrase "absentee ownership" and how it has a definite connotation, representing a dark figure in the economic system, a frustration of desired levels of self-sufficiency. In the early days, the giants of business enterprise had faces--Rockefeller, Vanderbilt, Ford, Edison--but they all turned into faceless bureaucracies, says Levy. The giants may not have been nice, but they had faces and human traits. Absentee ownership wiped that out for the common man. Veblen's book continues to be of vital importance to the studies of economics, political theory, and sociology.